Several years ago while living in London, I read The Reluctant Fundamentalist. This is important for two reasons: 1) I discovered the best flat white in the city (a Soho cafe on Berwick Street) and 2) Hamid’s powerful story. The distinct narrative. Changez, an eighteen-year old Pakistani comes to Princeton intent on seeking the American dream; he graduates, gets a job in the financial sector and then falls in love with Erica. I saw Erica as a symbol of America (or perhaps the American dream), flawed but beautiful; enticing but ultimately unattainable. It’s an intriguing story, the relationship between Changez and Erica is interesting. Life for Changez changes Post 9/11, as a Pakistani people see him differently — with suspicion. I loved reading The Reluctant Fundamentalist, it’s an amazing novel that was shortlisted for the Man Booker. Over the years I’ve read Hamid’s essays in The New Yorker and The Guardian, so I was very excited at the prospect of reading a collection of Mohsin Hamid’s essays. 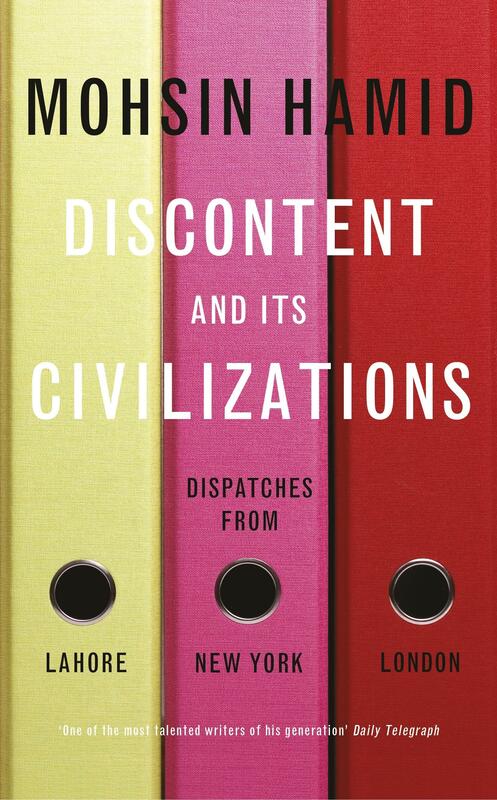 Discontent and Its Civilizations Dispatched From Lahore, New York, and London does not disappoint, it’s a compelling read. There are three sections in the book: life, art and politics. Essays like “When Updike Saved Me from Morrison (and Myself)” reveal a witty Hamid while “A Home for Water Lilies” and “It Had to be a Sign” convey the uncertainty of life in Pakistan. I must admit I know very little of Pakistan (outside news coverage of suicide bombings, which occur frequently), the politics and cultures are far too complex for an outsider to fully comprehend. I never once thought about what 9/11 meant for Pakistanis, nor did I wonder whether the drones and violence that occurs there could be a product of the war in Afghanistan. After reading “The Countdown” I did ask myself those uncomfortable questions, but I don’t know the answers. Who wants to imagine that their country destabilized another while trying to recover their own sense of security? From what I’ve read the country has had a history of problems long before the United States invaded Afghanistan. Still Hamid has facts and figures: “35,000 Pakistanis have died in terror and counter terror violence” (after 9/11), he also points to a Pew Global Attitudes Project which states only 12% of Pakistanis have a favorable opinion of the US. Both figures were a surprise, but nothing was more surprising than Hamid moving his family to Lahore. He describes the beauty of a Pakistani monsoon and life in an unstable country. It’s a fascinating dichotomy. I read “Islam is Not a Monolith” just before hearing Rupert Murdoch’s tweet that all Muslims are to blame for the Charlie Hebdo murders/Paris terrorist attacks. Many people believe that Islamophobia is an invention and it doesn’t function in the same manner as racism, at least that is novelist Michel Houellebecq’s argument. So much of Hamid essay is relevant in today’s climate. Hamid writes with eloquence about complex issues such as the persecution of the Ahmadis, peace with India and reforming Pakistan. This book is a must for anyone who reads Mohsin Hamid. Publisher: Hamish Hamilton. Format: Hardback, 208 pages.